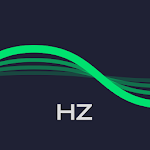 With Sound Wave Generator you can easily generate sound tone from 1Hz to 25kHz, and easy to adjust the frequency by swiping your finger up and down. Sound and noise with different frequencies can be used in different scenes. If you want to stop your neighbor's dog from barking, you can turn on the generator and tune the frequency until the dog stops barking. In the same way you can use this tone generator as a dog whistle to train your dog, such as sitting, barking or running. The sound with certain frequency can be very noisy, and you can use it to annoy your classmates or friends. - Test your audio equipment. 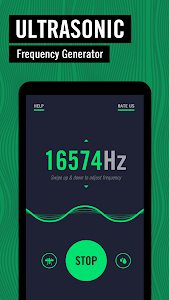 - Test your hearing and see what's the highest frequency you can hear. 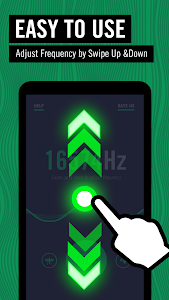 - Annoy your friends with high frequency sound. - Stop dog from barking. - Train your dog with it as a dog whistle. Disclaimer: the sound generated by this app may be noisy or even harsh, please take caution when you use it for security. Similar to "Sonic Sound Wave Generator with all Tones"